Today, as many countries are determined to put forth every effort in order to revive the Great Silk Road, a growing number of people take a lively interest in the history of this ancient transcontinental trade highway, as well as in the unique ancient monuments, national arts and crafts, cuisine, traditions and holidays of the peoples of the region, in the long-standing cultural wealth passed down to us by the renowned ancestors. Let us remember the famous 'Book' by Marco Polo, the earliest of all the guidebooks. Seeking after luck in trade, Marco Polo, a Venetian merchant, set out on a journey along the Great Silk Road in 1271. But during his almost 25-year-long travels about Oriental countries he was so much amazed and charmed by what he saw that he became a keen explorer of these mysterious lands. A work of great talent, Marco Polo's 'Book' helped to greatly increase European knowledge of the Orient. However, not long before his death in 1324, the great traveler said that he had not told even a half of what he had seen. It is noteworthy that in 1994 World Tourist Organization held its first international meeting in Uzbekistan, where at its session in Samarkand Marco Polo was called 'the first tourist to the Great Silk Road'. In 629 - 645 a Chinese traveler and Buddhist monk Xuanzang crossed Central Asia on his way to India. He vividly pictured this trip in his book 'Da Tan Si Yun Tsi' (Notes on Travels about Western Territories during Rule of Great Tan Dynasty in China). Six centuries ago, a Spanish ambassador Ruy Gonzalez de Clavijo kept a journal about his trip to Tamerlane's court in 1403. The journal is rich in keen observations of the eyewitness and helps to conjure up the images of that ancient and glorious era. In 1863 a brave Hungarian scientist Armenius Vambery, as a dervish under the name of Hajji Mohamed Reshad, managed to join a caravan and got to Bukhara which was a prohibited place for the Europeans. His vivid account of what he saw is an invaluable source of evidence of those times. And, no doubt, Guide to Central Asia by D. I. Evarnitsky, which was published in 1893 in S.-Petersburg, can be called the first edition of guidebook genre. A little later, in 1901, another Russian guidebook, Guide to Turkestan by I. I. Neyer, was published in Tashkent. Of course, there are some other old, less popular guidebooks to the countries of the Great Silk Road. It does not make much sense to mention them, for a lot of new guidebooks to the region of the Great Silk Road, Central Asia and Uzbekistan have appeared in recent years. These travel guides are a wonderful compass for those who intend to travel to this part of the world. 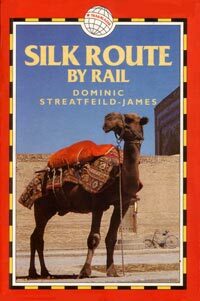 Many publishers around the world have issued in various languages and in big quantities travel catalogues and guidebooks dealing with the countries of the Great Silk Road. 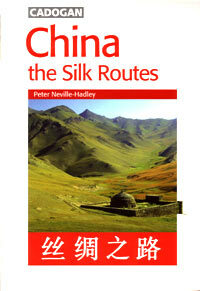 The following are the well-known guidebooks to the region of the Great Silk Road. Peter Neville-Hadley. China. The Silk Routes. - U.K., London: Gadogans Books, 1997. - 544 p. (In English). The author introduces his guide with the words: "This is an indispensable guide to Western China during travels by train, bus, jeep, and even by donkey-pulled cart if you wish to turn off the busy comfortable highways and have a look at the remote corners rarely visited by foreigners". Your route will lie along desert fringes, and then over high mountain passes. On the way you will see a lot of Chinese sights, such as ancient temples, palaces, parks, exotic bazaars - as if they have lasted intact from the times of the Great Silk Road. Along the ancient trade roads you will travel from Beijing and Xi'an to the west: to Bishkek, Almaty, and other Central Asian towns. This guide will help you to tailor an exciting journey. Dominic Streatfeild James. Silk Route by rail. - U.K.: Trailblazer Publications, 1997. - 273 p. (In English). The author notes that most people will mention China when the Great Silk Road is talked about. It is perfectly natural, since it was in China that silk was first made. Thus silk, which in ancient times was carried by trade caravans from China to Europe, gave the name to the ancient road - the Silk Road. However, until recently all the tourist routes had ended at the border of Xi'an. Only in 1986 it became possible to travel south over Karakorum Pass to Pakistan. After disintegration of the USSR, when its former republics gained independence, there arose new opportunities to develop the Silk Road tourism. The newly-built railway line from Almaty, Kazakhstan, to Urumchi, China, allowed ordinary tourists, for the first time ever, to travel from Central Asia to China. This means that besides visiting only China, Marco Polo's followers can now cross the border of this country and proceed traveling west, where they can see the famous ancient towns of Central Asia and other regions of the CIS. In Uzbekistan, you can start your journey in Khorezm oasis, where you will most certainly visit Khiva. In this town there have preserved very many ancient architectural monuments, whose history is connected with the history of the Great Silk Road. Khiva, surrounded by strong fortification walls, is called 'a museum in the open'. Then you can make further south to ancient Bukhara, decorated with a large number of gorgeous palaces, minarets and mausoleums. There you can see Kalyan, a grand 47-meter-high minaret, towering over the town. Next come the blue domes of Samarkand, famous for its beauty and grandeur since the town was the capital of the great empire of Tamerlane. The monuments of the ancient town of Shakhrisabz, aged 2700, are beautiful too. Now the Russians also have a good chance to see the ancient towns of the Great Silk Road. A journey from Moscow to Beijing does not take years today: express motorways and railways run along the branches of the ancient road. The guidebook contains a lot of information on the history of China, the CIS countries, and the Great Silk Road itself. It provides a detailed description of 16 towns on the itinerary: Moscow - Khiva - Bukhara - Samarkand - Tashkent - Almaty - Urumchi - Kashgar - Turfan - Dunxuang - Jiayuguang - Landjow - Tainshui - Xi'an - Luoiang - Beijing. There are also colorful photos, maps with the distances between the points being indicated in Russian, English and Chinese. The book provides recommendations on arrangement of individual and group tours and on tickets purchase. Judi Bonavia. The Silk Road. From Xi'an to Kashgar. / Revised by William Lindesay and Wu Qi. - Hong Kong: Odyssey Publications, 1999. - 338 p. (In English). 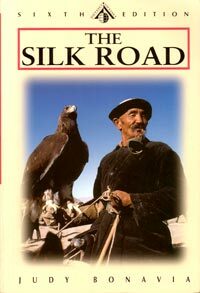 The author points out that the trade of silk and other exotic goods along the Great Silk Road was always dangerous and hard in the ancient times. Merchants led their caravans over some of the most inhospitable territories - waterless deserts and snow-bound mountain passes. Beginning at the ancient city of Chang'an (Xi'an), the route took traders westward along the Hexi Corridor to the Great Wall, then either north or south of the Taklamakan Desert to Kashgar, before continuing on to India, to Iran, or to the great cities of the Middle East. For today's travelers it is not only the weight of history that makes the Silk Road intriguing, but also the incredible diversity of vivid impressions of the unique architectural monuments, picturesque sceneries, and local people. Claus Richter, Bruno Baumann, Bernd Liebner. Die Seidenstrasse. 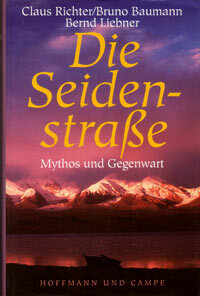 Mythos und Gegenwart. - Hamburg: Hofmann und Campe, 1999. - 304 p. (In German). On hearing such names as Kashgar, Taklamakan, Samarkand or Bukhara one can't help thinking of setting out on a romantic journey. These names are connected with the history of the Great Silk Road, the ancient trade route, which greatly contributed to the history of the world civilization. The author writes that the Silk Road led from the East to West, from Asia to Europe, stretching for thousands of kilometres between the ancient Chinese capital Xi'an and the Mediterranean coastline. For over 17 centuries trade caravans and diplomatic delegations, pilgrims, fortune seekers and healers used to travel up and down this trade route, the longest in history. Merchants from different countries carried expensive goods and wonder articles. It was by this road that silk, which was then the most precious thing in Western Europe and the price of which could become higher than that of gold, was imported from China; the major religions of Christianity, Islam and Buddhism were brought to the East. Flourishing oasis towns, which had emerged along the Silk Road, used to become international trans-shipment points, centers of crafts and dissemination of various cultures. As in the case of Marco Polo and Sven Hedin, who were charmed by the countries of the Great Silk Road in the past, this now-reviving caravan road makes a deep impression on the present-day tourists who, large in number, travel along its branches . The travel routes go through sultry deserts, high mountains, and ancient towns with gorgeous architectural monuments aged hundreds of years. Wijnand van Riel. De Zijderoute: Turkmenistan, Oezbekistan, Tadzjikistan, Kirgizie en Kazachstan. - The Netherlands: Edition Dominicus, 2000. - 344 p. (In Dutch). This colorful guide to the Great Silk Road, or to its Central Asian part, to be exact, was published by Dominicus, a Dutch publishing house. 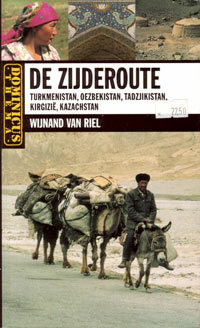 In the guidebook the author tells about his impressions of the travels along the former Soviet Central Asian countries: Turkmenistan, Uzbekistan, Tajikistan, Kyrgyzstan and Kazakhstan. Since early childhood Wijnand van Riel had been fascinated by the tales from Arabian Nights, by the books about such famous travelers as Marco Polo, and, of course, was dreaming of visiting the countries those books described. After completing a course in economic anthropology, he worked in the Middle East and Central Asia for several years. He wrote a number of articles and books that share the knowledge, various facts and legends he had gained in these regions. He wrote about Yemen, Iran, Uzbekistan and Turkmenistan. In this new book of his, with a lot of affection, Wijnand van Riel gives a description of the five independents states of the former Soviet Central Asia in view of their centuries-long history, traditions and unique architectural monuments. He sounds especially fascinated while writing about the ancient towns of Samarkand, Bukhara, Khiva and Merv. As the author invites to make tours around the countries of the region, he points out that the crossroads of the Great Silk Road in these countries used to be of great importance and formed the so-called ' golden section' of the ancient international highway. A large number of monuments of spiritual and material culture of the past centuries have preserved to the present day in the land populated by very hospitable people. * Puteshestviye venetsiantsa Marco Polo v XIII stoletii, napechatannoye v perviy raz vpolne na nemetskom yazike po luchshim izdaniyam i s obyasneniyami Avgustom Byurkom. ( Travel of Venetian merchant Marco Polo in the 13th century, for the first time fully published in German on the basis of the best editions and with explanations made by August Burke. Translation from German by Shermyakin A.N.). - Moscow: University printing house, 1863. (In Russian). * Minayev I.P. Puteshestviye Marko Polo. Perevod starofrantsuskogo teksta. (The Travels of Marco Polo. The translation from the Old French manuscript.). - St.-Petersburg: Edition of the Imperial Russian Geographical Society, 1902. (In Russian). * G. Hart. Venetsianets Marko Polo. (Marco Polo, the Venetian). - Moscow: Foreign Literature Publishing House, 1956. (In Russian). * Rui Gonzales de Klaviho. Dnevnik puteshestviya v Samarkand ko dboru Timura (1403-1406). (Ruy Gonzalez de Clavijo. Narrative of the journey to the Court of Timur at Samarkand. 1403-1406). - Moscow: Nauka Publishing House, 1990. (In Russian). * Evarnitsky D.I. Putevoditel po Sredney Azii. (Guide to Central Asia). - St.-Petersburg, 1893. (In Russian). * Neyer I.I. Putevoditel po Turkestanu. (Guide to Turkestan). - Tashkent, 1901. (In Russian). * Armenius Vambery. Puteshestviye po Sredney Azii. (Travel to Central Asia). - St.-Petersburg, 1865. (In Russian). * The Travels of Marco Polo: the Venetian. / Renewed by Manuel Komroff. - USA, New York: Liveright Publishing Corp., 2000. - 357 p. (In English). * Fisher Richard B. The Marco Polo Expedition. - UK, London: Holder & Stroughton, 1988. (In English). * Peter Neville-Hadley. China. The Silk Routes. - U.K., London: Gadogans Books, 1997. - 544 p. (In English). * Dominic Streatfeild James. Silk Route by rail. - U.K.: Trailblazer Publications, 1997. - 273 p. (In English). * Judy Bonavia. The Silk Road. From Xi'an to Kashgar. / Revised by William Lindesay and Wu Qi. - Hong Kong: Odyssey Publikations, 1999. - 338 p. (In English). * Claus Richter, Bruno Baumann, Bernd Liebner. Die Seidenstrasse. Mythos und Gegenwart. - Germany, Hamburg: Hofmann und Campe, 1999. - 304 p. (In German). * Wijnand van Riel. De Zijderoute: Turkmenistan, Oezbekistan, Tadzjikistan, Kirgizie en Kazachstan. - The Netherlands: Edition Dominicus, 2000. - 344 p. (In Dutch). * Guide-book Gio Globe Trotter. Russia, Ukraine, Caucasus and Central Asia, 1997-1998. - Japan, Tokyo: Dimond Big Co. Ltd, 1998. - 262 p. (In Japanese).